The Chesapeake Bay is a vital part of Hampton Roads Virginia. 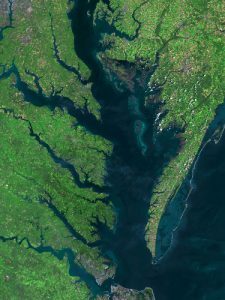 Between Hampton and Norfolk, the lower Chesapeake Bay merges with the harbor of Hampton Roads. At Cape Henry, the estuary merges with the Atlantic Ocean, creating a treacherous formation of shoals, channels, and tide rips. Vessel traffic enroute to the cities of Norfolk, Hampton, Newport News, and Portsmouth from the Atlantic Coast must enter the Chesapeake Bay before entering the port of Hampton Roads or one of the smaller harbors along the Bay’s western edge.